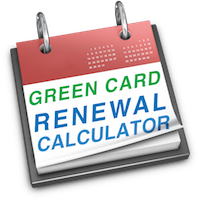 It currently takes approximately 10-12 months to renew or replace a green card. In some cases, it may take longer. For a detailed look at the green card renewal / replacement time line, see what happens after filing Form I-90. You can check the actual USCIS processing times on the USCIS.gov website. USCIS generally updates the data on this page monthly. Many people need to travel abroad and realize that their green card is missing or expired. In this situation, it is possible to get temporary proof of permanent residence so that one can re-enter the United States. The same solution applies for those that need to accept new employment, get a home loan or even renew a green card. 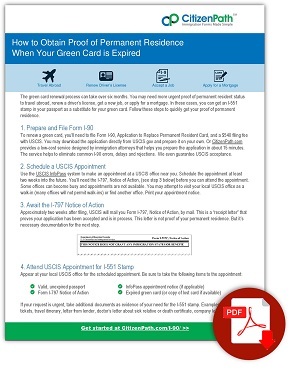 When you prepare your green card renewal/replacement through CitizenPath, we’ll provide you instructions on getting temporary proof of your permanent resident status. As a rule of thumb, file Form I-90, Application to Replace Permanent Resident Card, six months prior to the expiration of your current green card. For extensive information about the problems associated with renewing too early or too late plus many frequently asked questions, visit When to Renew a Green Card.